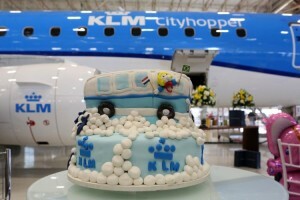 KLM Cityhopper welcomed yesterday its first E175, from Embraer, at Schiphol Airport. The new aircraft will allow KLM Royal Dutch Airlines and KLM Cityhopper to continue their contribution to more efficient and environmentally friendly operations in which quality and passenger comfort hold an important place. 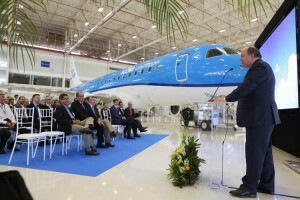 The aircraft feature a new wingtip that, among other technical enhancements, improves aerodynamic performance. Fuel consumption on a typical flight is 6.4% lower than the original E175.KLM Cityhopper today welcomed its first E175, from Embraer, at Schiphol Airport. The new aircraft will allow KLM Royal Dutch Airlines and KLM Cityhopper to continue their contribution to more efficient and environmentally friendly operations in which quality and passenger comfort hold an important place. The aircraft feature a new wingtip that, among other technical enhancements, improves aerodynamic performance. Fuel consumption on a typical flight is 6.4% lower than the original E175.